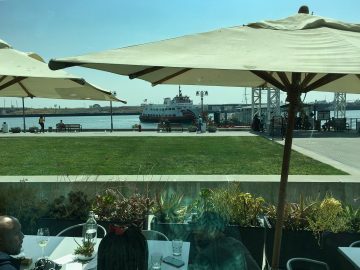 It was a lovely day strolling Jack London Square, enjoying a bustling Farmers Market on this warm August Sunday. 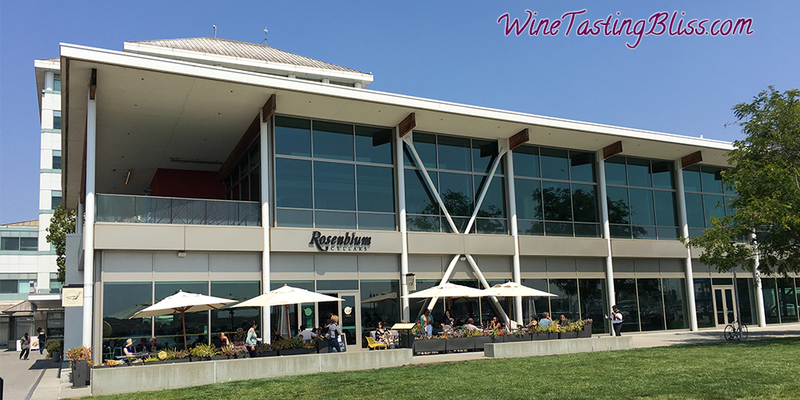 As we reached the end of the waterfront walking path we came upon one of the anchor tenants of the Square, Rosenblum Cellars. It had been several years since our last visit, so we went in to get reacquainted. 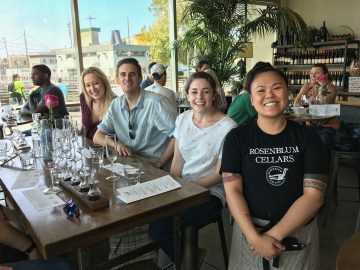 One of the reasons that we enjoy visiting the Rosenblum tasting room is that it has a great view of the Jack London waterfront and marina. We entered the tasting room to find the space bathed in sunshine and bubbling with happy chatter. Nearly every table was occupied, but there was plenty of space along the bar which lined the floor-to-ceiling windows. Our arrival was propitiously timed, though, as a party was just leaving a 6-top table, which we gratefully occupied. We were greeted by wine guide Hope, who oriented us to the operations of the tasting room and took our wine orders. 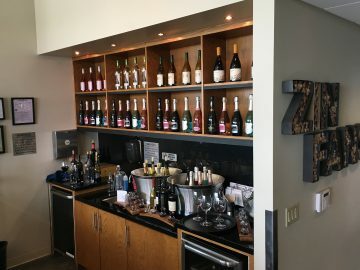 The tastings were delivered as a combined flight, with each taste in its own glass, in the case of sparkling wines, or in small carafes for still wines. To keep things simple, a descriptive card was delivered with each flight, describing each taste in turn. This approach allowed a few wine guides to easily support many tables of wine tasters. 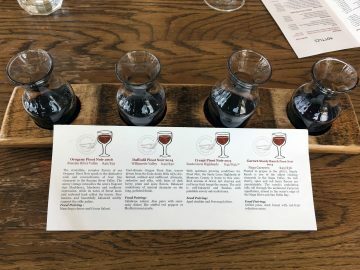 Our group was evenly divided between sparkling and still flights, with both Zinfandel and Pinot Noir flights covered.I chose the Pinot Noir flight, since the previous day was National Pinot Noir day. The first taste was their 2016 Orogeny Pinot Noir from the Russian River Valley. It had flavors of plum and slate, with mellow mid-palate berries, followed by musty tannins toward the finish. Next up was the 2014 Daffodil Pinot Noir from the Willamette Valley started with a burst of cherry flavors followed by cinnamon spice and pomegranate notes. The finish lingered with dark plum and tannins elements lasting for several minutes. The third taste was their 2013 Crespi Pinot Noir from the Santa Lucia Highlands showed almost no aroma and great balance of fruit and acid on the tongue, leading to a surprisingly oaky finish. The final taste was a 2014 Garnet-Stanly Ranch Pinot Noir from the Carneros District had a somewhat funky nose of mushroom and cabbage and layers of cherry and earth on the palate. With our thanks to Hope, we settled our tab and rejoined the throngs of people strolling in the sunshine. Cheers to Rosemblum Cellars! Have you visited Rosenblum Cellars? Click to give'em a tweet of support!